Underfloor Heating Cables can be installed on top of either suspended floors or solid concrete floors enabling installation in all types of rooms. Being loose wire it is ideal for irregular rooms with limited space. The cable can be installed under many floor coverings: Ceramic, Natural Stone, Slate, Quarry stone, Porcelain, Marble, Limestone & Terracotta. 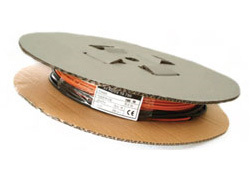 Ecoflex cables are ideal for smaller installations or in rooms with an irregular layout. The flexibility of the loose cabling system makes it possible to heat the maximum floor area including hard reaching areas. 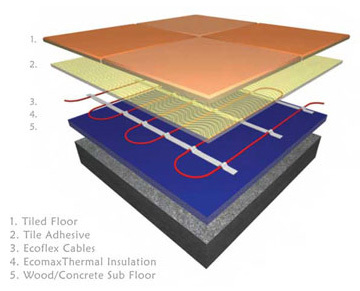 For direct heating applications on thin floors the maximum cable rating used should be 10W/linear metre. Ecoflex cables are available as a loose cable option or complete with a choice of thermostats. Ecoflex comes with a 10 year guarantee against manufacturing defects. Ecoflex Underfloor Heating Cables are very simple to install by following the instruction booklet included with each cable kit. 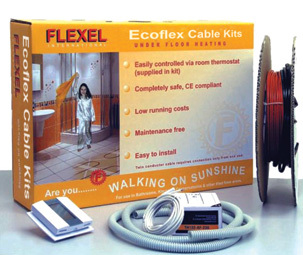 Ecoflex Underfloor Heating Cables is available as a loose cable only option for professional or diy installer use.